WASHINGTON, DC, April 24, 2012 (ENS) – Up to $5 million will be available this year to develop “plug-and-play” solar photovoltaic systems that can be purchased, installed, and operational in one day, U.S. Energy Secretary Steven Chu announced today. Plug-and-play solar energy systems will make the process of buying, installing, and connecting solar energy systems faster, easier, and less expensive, said Chu. This effort is part of the Energy Department’s strategy to advance solar power deployment by reducing non-hardware costs, which Chu calls “soft” costs, such as installation, permitting, and interconnection. The cost of solar photovoltaic modules is coming down, so soft costs and other non-module hardware costs, such as electronics and mounting hardware, now account for a majority of the total costs of residential solar PV systems. “The department’s announcement today supporting plug-and-play solar energy technologies will help make it easier and cheaper for consumers to adopt clean, affordable solar energy, while supporting U.S. manufacturing leadership in the next generation of clean energy technologies and diversifying America’s energy portfolio,” said Secretary Chu. The Department of Energy intends to invest up to $25 million over five years to advance the development of a commercial plug-and-play photovoltaic system, which is envisioned as an off-the-shelf product that is fully inclusive with little need for individual customization. 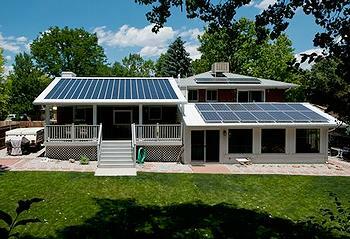 The funding will help drive innovations to upgrade the design and installation of residential PV systems, reducing costs for homeowners through more efficient installation and permitting processes and new ways to affordably and effectively connect solar panels to the grid. Homeowners would be able to install a PV system without special training or tools by simply plugging it into a PV-ready circuit. An automatic PV discovery process would initiate communication between the system and the utility. Plug-and-play systems are already in wide use in the computer and automotive industries. Secretary Chu believes that similar innovations can be made in the solar energy industry to reduce costs and simplify installations. As part of the planned five-year program, the Energy Department will invest an initial $5 million this year for two projects that will develop innovative plug-and-play prototypes through partnerships with universities, industry, utilities, and other stakeholders. The department plans to make an additional request of $20 million to Congress over the next four years to support these efforts. This move is part of the SunShot Initiative, a collaborative national effort to make solar energy cost competitive with other forms of energy by the end of the decade, said Chu. Inspired by President John F. Kennedy’s Moon Shot program that put the first man on the moon, the SunShot Initiative has created new momentum for the solar industry by highlighting the need for American competitiveness in the clean energy race.